Apple has filed a patent that reveals some of the ways it might utilize sapphire in its future devices, like the iPhone 6 and the next iPad. The patent actually describes ways that sapphire might be attached to electronics, but in doing so it reveals potential applications for the material. We already know that Apple might use a sapphire coating to make its devices' screens even tougher than the Gorilla Glass it currently uses. Sapphire is hard to break and literally crystal clear, after all. But how about using sapphire to dissipate heat from an iPhone's processor? It turns out sapphire conducts heat just as well as some metals do, and the new Apple patent describe mounting the crystal to a device's chip to help absorb some of those degrees. When it comes to how the sapphire would actually be mounted, the patent describes a few techniques. In one instance, melted plastic or metal is poured through an aperture in the sapphire surface, thereby binding them together when it cools. Then electronics can be attached to the metal or plastic. Another method describes a molding technique that would attach other materials directly to the sapphire substrate's edges. Sapphire is already being used in Apple's devices - as the camera lens cover on the iPhone 5, and as the fingerprint sensor cover on the iPhone 5S. And crystal specialists GT Advanced Technologies revealed in November 2013 they had signed a multi-year supply deal with Apple. Apple's plans for the material going forward are unknown, but it's clearly investigating every option for its new iDevices. 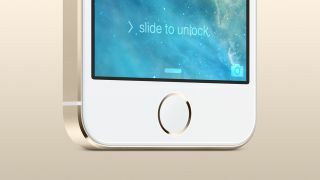 Is a fancy sapphire fingerprint reader enough to make the iPhone 5S the best? Read TechRadar's review to find out what we think.